Coleus plants are known for their colorful, variegated leaves and can be excellent additions to an indoor or outdoor garden. They may come in yellows, greens, reds, and some even come in pinks or purples. They require attention to maintain a bushy, attractive appearance but grow easily in the right conditions. Propagate coleus plants from softwood cuttings a few inches long. These may be placed in average to good soil and watered regularly to root new plants. Keep plants evenly moist. A mister or spray bottle may be used to help maintain humidity in periods of extreme heat. Apply all-purpose fertilizer during the growing season to help plants gain their full potential. Prune the plants in any season by pinching the new stems and leaves. This helps plants grow new stems and bushier, more compact growth. Stake the stems if they begin to seem weak. Coleus plants come in a range of colors from pale yellows and greens, to pinks and dark reds, and even dark purples that resemble black. Foliage usually shows a variegated leaf with contrasting shades, and the ornamental nature of the leaves is a great addition to any garden and a substitute for seasonal flower growth. Coleus plants may also be grown indoors in bright light. Coleus plants are native to Africa and southeast Asia, including Malaysia, the Philippines and Australia. Today, they are grown all over the world by gardeners and plant lovers. As a member of the Lamiaceae family, Coleus are related to mint plants and sages. Although they used to be known under the genus Coleus, botanists now classify coleus plants under the genus Solenostemon. Coleus plants prefer average to good soil, bright light and regular watering. They may droop quickly when dry and need to be misted during times of heat. They are also sensitive to cold conditions and die off in frost or snow. Fertilize coleus plants and pinch any flowers off regularly to encourage leaf growth. Coleus can easily be grown from seed, but this is a less popular method for propagation, since the plants don't come true from seed. This means that the new plant may not resemble the plant that the seeds came from. Instead, most plants today are grown from cuttings from older plants, which ensures that plants will have the same coloration. Coleus have no special requirements for repotting. Transplant coleus plants each year or when the roots have filled the pot. New cuttings should root quickly. Select coleus seed in the colors and leaf shape you prefer. Many people prefer to plant a variety of coleus seeds from packages of mixed seed. Choose coleus seed that matches your lighting. Some coleus plants develop deep rich color in direct sunlight, while others produce the best color in partial shade. 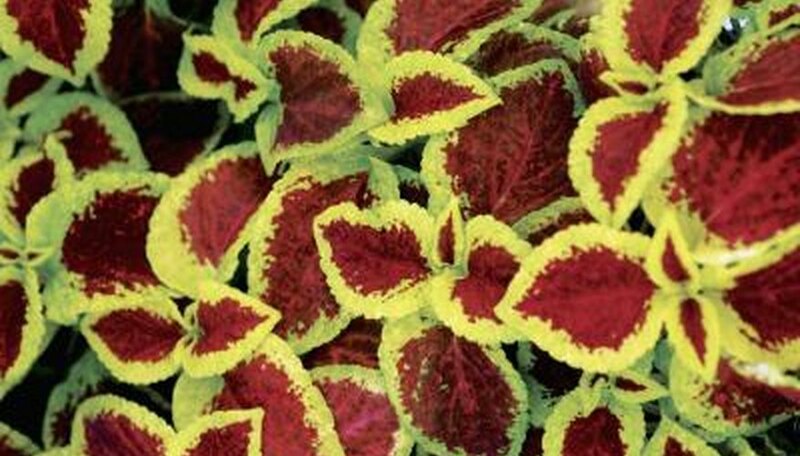 The Solar Series features coleus plants that thrive in afternoon sun and develop subdued colors if planted in the shade. Pour the appropriate amount of seed starter in a large bowl or bucket. Add water. Mix to evenly distribute moisture. Fill peat pots or flats to 1/4- to 1/2-inch from the top. Sprinkle coleus seeds on the surface of the seed starter and press into the soil. Coleus seeds require light for germination and should not be covered with soil. Mist or water if the seed starter feels dry to the touch. Place in a sunny location. Keep soil evenly moist until seedlings appear in 10 to 14 days. Avoid placing seedlings in direct afternoon sun until they are 2 to 3 inches tall. Order seeds from an online nursery or buy packets at your local garden center. Place the seed trays or peat pots on a tray. Fill them with seed-starting mix to within a quarter inch of the top of the container. Moisten the mix with warm water. Sow three or four seeds in each seed pot. Don't overlap them. They should be spaced evenly in the pot. Sprinkle a thin layer of seed-starting mix on top of the seeds -- just enough to cover them. Use a spray bottle to moisten the soil covering the seeds so they can start germinating. Place the seed trays in a sunny window that receives at least six hours of sun a day or supply an artificial light source. Place a heating mat under the tray if you cannot keep the room temperature at 70 degrees Fahrenheit. Keep the soil moist while the seeds are germinating by using the spray bottle daily to wet the soil. Once you see seedlings, water from the bottom. Pinch the weakest seedlings from each pot to allow only the strongest to grow. Fill a 10- to 12-inch-wide container 2/3 to 3/4 full with potting soil. Remove coleus transplants from their plastic containers. Break apart the plant root balls by massaging them with your fingers. Untangle any tangled roots with your fingers. Space coleus in the container, spreading the roots out in the soil with your fingers. Rosy Dawn Gardens suggests planting three or four coleus per 10- or 12-inch container, or one coleus plant per 6- or 8-inch container. Cover over the plant roots with potting soil. Don't compress the soil; instead, mound it over the coleus roots. Water the container thoroughly until the soil settles around the plant roots and becomes saturated. Place the container in a full sun to part sun, depending on the requirements of your coleus species. Mulch the container to help the plant retain water. Water coleus deeply (until the soil becomes saturated) each time it becomes dry to the touch. Pinch back coleus to encourage new growth. Grasp a new shoot between your thumb and forefinger, and pick it off. Pinching encourages side shoots, which will help your coleus grow bushy. Pinching also discourages flowering, which keeps your coleus producing colorful leaves. Move coleus plants indoors when temperatures fall to 50 F. Place coleus near a southern-facing window or a sufficient grow light. Continue to water regularly; keep indoors until the temperature rises to 50 F again.